We celebrated our family Christmas on New Year's Day since I had to work over Christmas. It's always such a blessing to gather together! This year, made doubly fun by the addition of these two sweet little girls! 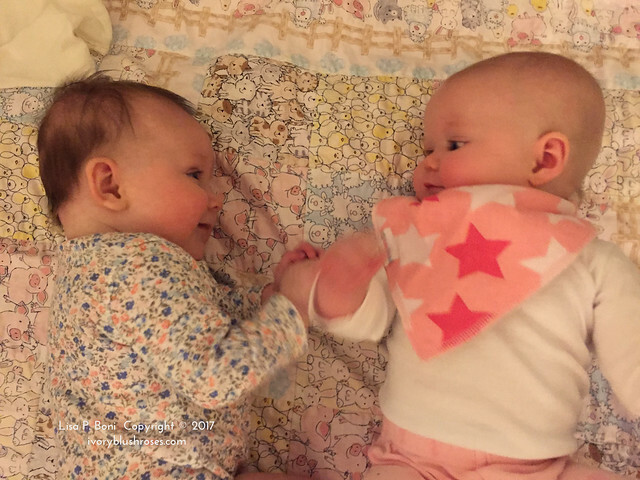 At 3 and 4 months, they are gooing and gurgling and have such a grand time interacting with one another! Who could resist this sweet face?! I know that through the coming year, there will be so many amazing moments with these two sweet grandbabies! There are lots of projects in the works as always. Every year, I make up a list of all the projects I want to complete and new ones I want to start. It always seems immensely do-able. But the year end comes and so many of them remain unfinished! I keep hoping though, that one day, my to-do box actually will actually get emptied out! One of the big things I hope to work on this year is to simplify my life a little bit. This past year, it felt like things were getting away from me in a big way. I've already started prioritizing the things I say yes to, and saying no a bit more often to the things that wear me down. A big goal is to continue downsizing my belongings. I have dreams of a minimalist lifestyle ~ but as someone who is a packrat at heart and who loves to create things, that's pretty challenging! Part of the minimalist dream is to live more frugally, more efficiently, to have less of an impact on the environment. This is something I've been working on for a long time, but I think it's time to step up my efforts a bit. I'm going to do my best to eliminate most plastic from my life as well as decrease the amount of un-recycleable trash I produce. I already produce more recycling than I do trash ~ about 2 to 1, but I know I can do better, and the hope is to reduce both recycling and trash. I also need to do some thinking about how to make a living doing creative things that don't demand 12 hour shifts on my feet. My health and well being is demanding a change and I need to start paying attention and taking positive action! After going through the list of all my potential projects here are the big ones that I want to finish this year. Each year, I usually have at least one "book" project that I work on, including putting the previous year's blog posts into a book format. Last year, I finished up our family cookbook! It turned out really well and the kids were each so happy to at last have the family recipes that they wanted most without having to call me every time! 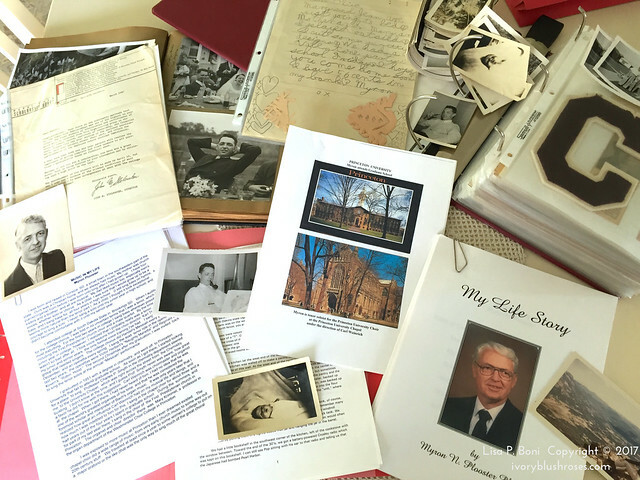 Before she died, my Mom had put together my Dad's and her Memoirs. They each spent a lot of time writing down stories from their life and compiling scrapbooks of all the important bits of their histories. My Mom wanted to put them into book format, but then she passed away, just as I was getting started scanning the photographs for it. With the family cookbook out of the way, this is the year of my Dad's Memoirs. Combining all the writings, the photographs and memorabilia and putting it into book form for all the family members and friends who would like a copy. I am also nearly finished with the Advent book that I've been working on. It will be ready soon and when it is, I'll make the link available to purchase. 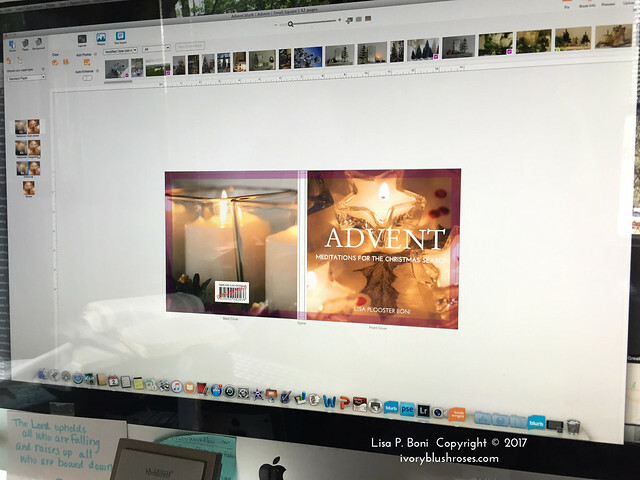 It's a compilation and re-working of many of the Advent meditations that I've done on the blog over the years. 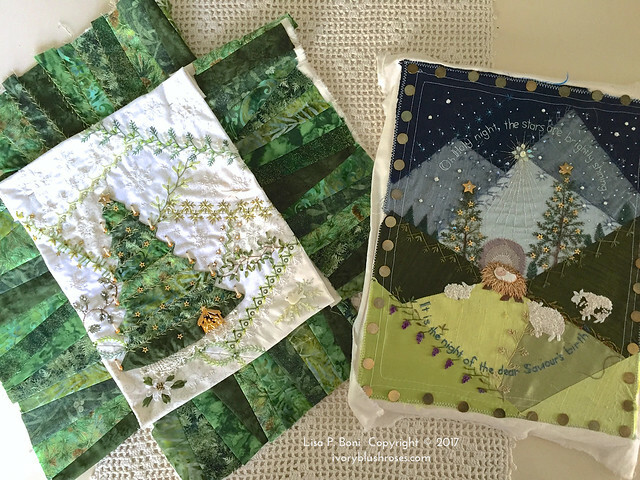 Speaking of Advent things, I have the two Christmas Crazy Quilt projects that I would like to finish. Both are so close... Just need to get in gear and get them done! Then there is the Hearts Round Robin that I would like to complete. I have 5 finished blocks and one unfinished block. In all, I would like a total of 9, so need to make at least 3 more before this one will be ready to assemble! 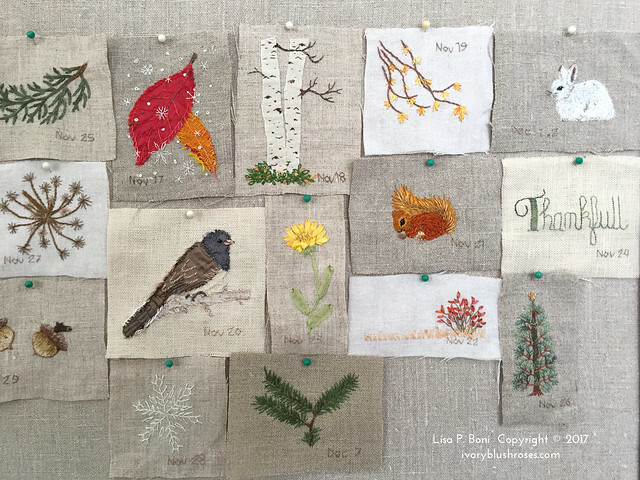 I had such fun with the Daily Stitchings in November and would like to continue some measure of this off and on throughout the year. Along the line of Daily Stitching is the idea of doing Daily Paintings. Doing these watercolor sketches makes me so happy and it's something I want to make more time for, even if just on a weekly basis. Oil painting is going to the back burner for a while. Especially while I'm still working. There simply aren't enough hours in a day to do all the things I love to do, so I've made a hard decision to let this one rest for now, though I may dabble from time to time. I have some ideas ruminating in the back of my mind about new directions to take my stitching work. I have loved crazy quilting, and will continue to do it, but I'm going to branch out into some other areas as well. 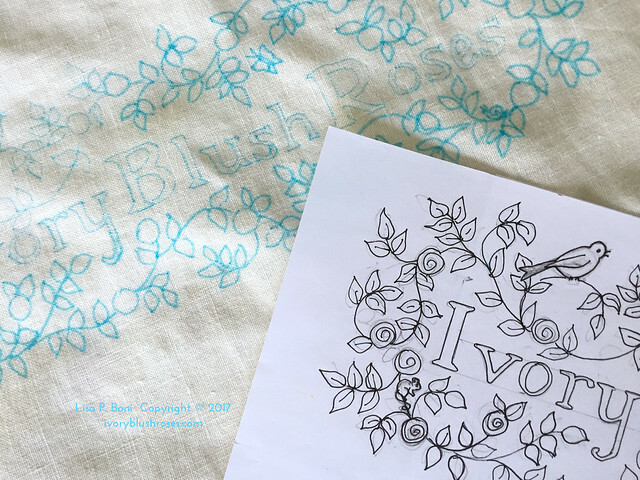 One of the new projects I'm going to work on is an embroidered piece for my blog header! 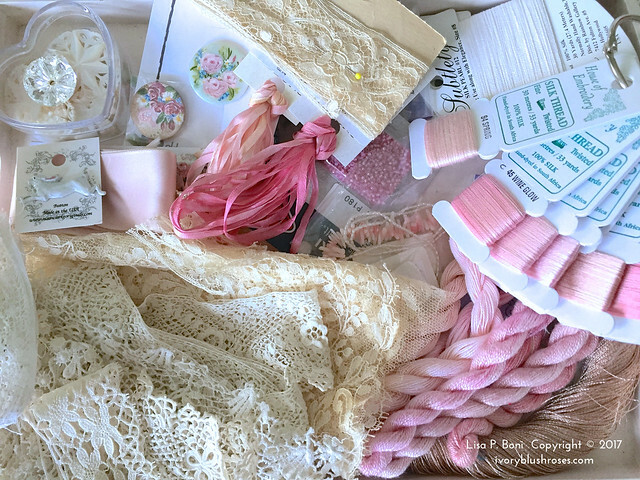 Then I have this tray of lovely ivory and blush pink bits, that I keep out for inspiration. 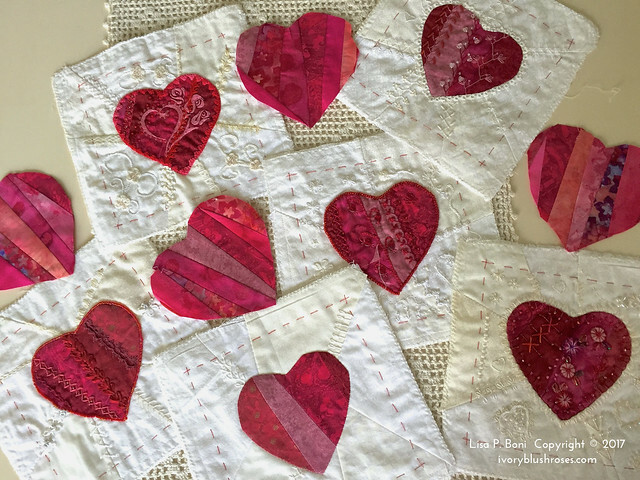 One of these days, it's going to turn into a crazy quilt block. I was hoping to work on it last year, but it never happened, so hopefully this year it will! And if that doesn't keep me busy, I have a big basket filled with unfinished projects that I can choose from! Dear Lisa ~ Once again your posting has inspired me. May 2017 bring you joy and may you accomplish all that you would like to. Your header done in embroidery and laces will be just beautiful!!! 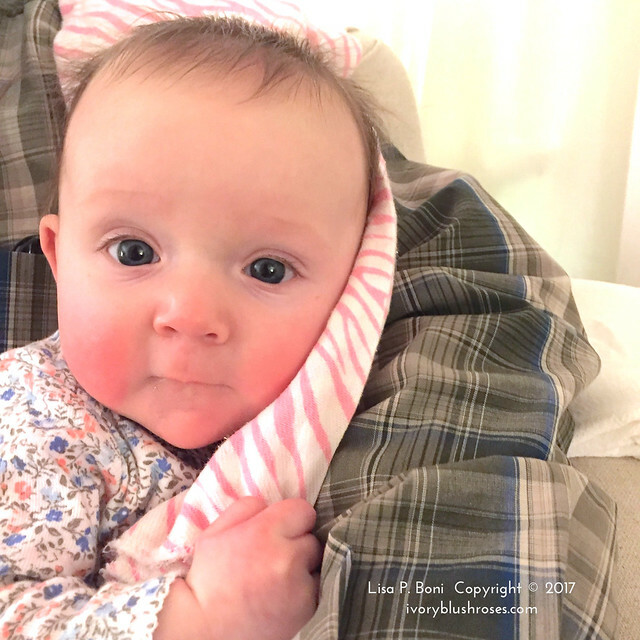 Your grand babies are a delight! Love seeing all your creative endeavors they are inspiring. Thanks and Happy Green New Year! 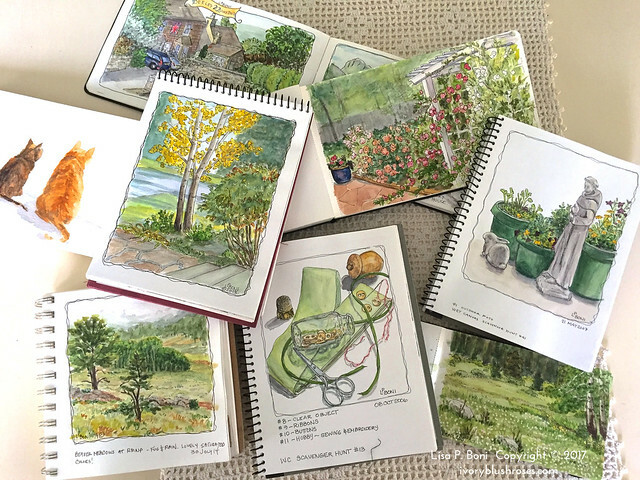 So many talents and blessings, Lisa, so I'll just mention your wonderful watercolor sketchbooks. They remind me of ones I saw at Disneyworld this year. Those Imagineers get paid to travel and paint. Woo hoo. Yours are just as fabulous. Enjoyed reading a couple of your posts. Happy 2017 and good luck with your goals! I am new to crazy quilting and I was wondering if you sketch your little animals or flowers that you embroider before you sew them?